Rewind to that very first day on December 1st, when we arrived at our cozy little beach cottage. Our vacation rental owner was going through her spiel, quickly showing us around the place. I started daydreaming (probably about the beach) right around the time when she was telling us how to use the awning. I heard the words "double kayak" and snapped back to reality. "Say what? You have a double kayak for us to use?!" Hallelujah, my dreams were coming to fruition! We could use it every day if we wanted, I thought to myself! Or at the very least, every other day. Later the next day we learned there was no way to transport it to the beach except for the use of our very own muscles. Oh dear. My tiny pencil-arms were in for a treat! Usually wheels fit on the bottom and one can effortlessly roll it to the beach but now I knew it was going to take some serious effort to get that sucker to the ocean. 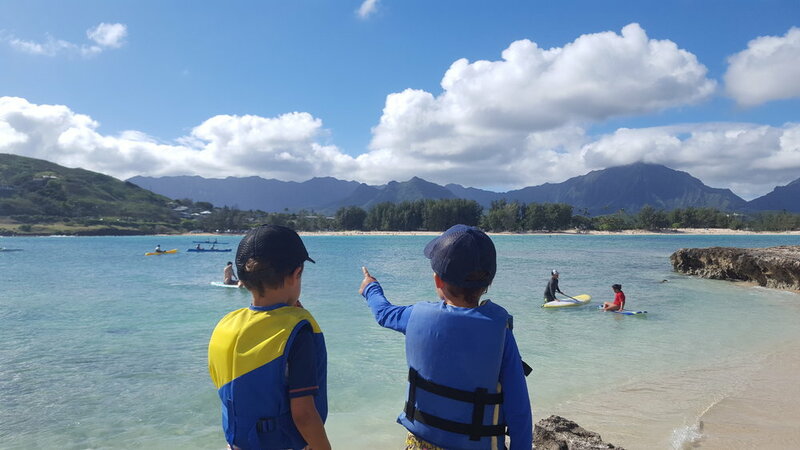 As the days flew by on Oahu, I started to get the feeling in the pit of my stomach that we might not take the kayak out. 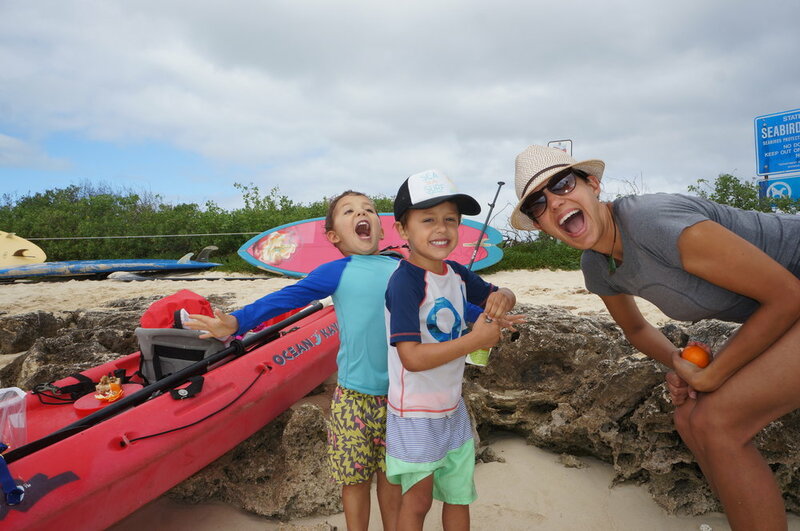 We only had one more week in Kailua and if one is going to kayak in Oahu, then one must do it in Kailua. The views. The insanely turquoise water. Possible sea turtle sightings?! It's the bees knees, just trust me on that. The boys were just as eager as I was since we mentioned it almost daily. "Will we get to go in the kayak today?" They pleaded with me and Chip. Finally, on Christmas Eve day they received their wish. We woke up that morning and the beach was hopping by 8 am. Everyone and their mothers were out celebrating already. People were jogging, biking, SUPing, swimming, and playing music in the park. The kids were out frolicking at the shore. And the Japanese were in selfie-stick heaven posing this way and that. We decided today was it for us. It was the perfect day to muster up enough balls to carry that monster of a kayak down to the beach and head out for a ride. We announced to the boys that their Christmas present from us arrived. "Woo hoo," they exclaimed! Chip and I were happy to continue our tradition of giving an experience as a gift (you know the sayings, "experiences not things" or "memories over material items" That's what we have been going for). Anyway, we made a big deal out of it, excitedly speaking about how we were going to ride out into the sea and kayak all the way to Flat Island where we would dock, eat lunch, and swim. We loaded up the life jackets, hoisted the kayak up, and began to walk. Five seconds later, I set it down in desperation. Damn, it was heavy. After psyching myself up, I went for it again and made it fifteen seconds. This went on for what felt like a hundred times. But eventually we made it to the beach. Thankfully, we were only a block away! Ha. The boys had a blast and especially liked riding the mini-waves as we made our way back to shore. Dad saw a sea turtle but we were too late to spot it. And we surprised the boys with candy canes on the ride from Flat Island back to Kailua Beach. The only minor-freak out happened on the walk back to the house as we were carrying the kayak. But my tantrum didn't last that long. It was a Christmas Eve for the books and one I'll never forget! We made it to Flat Island! Heading out for a swim (you can see Kailua beach in the distance. This is where we started). Checking out the ocean activity. "Hey look mom, we're having a dance party."